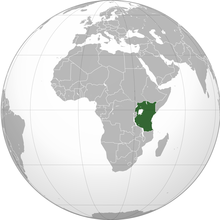 The East African Federation (Swahili: Shirikisho la Afrika Mashariki) is a proposed political union of the six sovereign states of the East African Community – Burundi, Kenya, Rwanda, South Sudan, Tanzania and Uganda – as a single federated sovereign state. In September 2018 a committee was formed to begin the process of drafting a regional constitution. An orthographic projection of the world, highlighting the proposed East African Federation's territory (green). Swahili would be the lingua franca and the official language would be English. The proposed capital is the Tanzanian city of Arusha, which is close to the Kenyan border. Arusha is the current headquarters of the East African Community. The union's proposed currency would be the East African shilling, which according to a 2013 published report is slated to become the common currency of five of the six member countries by 2023. The GDP (PPP) estimate would be US$472.238 billion and be the fifth largest in Africa and 43rd largest in the world. The federation of the current East African Community into a single state has been discussed, with early estimates of the founding of the federation in 2013. In 2010, the EAC launched its own common market for goods, labour and capital within the region, with the goal of a common currency by 2013 and full political federation in 2015. South Sudan was approved for membership of the EAC in March 2016, and acceded in September 2016. It would become the 6th member of the East African Federation. It is unclear how the potential accession of South Sudan to the EAC may affect the timeline for federation or the scope thereof, but given the infrastructure problems that persist in the fledgling country since President Salva Kiir Mayardit cut off oil commerce with Sudan, the South has decided to invest in constructing pipelines that circumvent Sudan's, which it had been using until that time. These new pipelines would extend through Ethiopia to the ports of Djibouti, as well as to the southeast to the coast of Kenya. These collaborations could increase the likelihood of South Sudan joining the East African Federation at some point. On 14 October 2013, the leaders of Uganda, Kenya, Rwanda and Burundi began a meeting in Kampala intending to draft a constitution for the East African Federation. In December 2014, efforts for a full political federation had been pushed back to 2016 or later. In February 2016, Ugandan President Yoweri Museveni described the union as “the number one target that we should aim at”. In November 2016 the EAC Council of Ministers agreed to create an East African Confederation before the East African Federation is eventually created. In the early 1960s, around the time Kenya, Tanganyika, Uganda and Zanzibar were gaining independence from the United Kingdom, the political leaders of the four nations had become interested in forming a federation. Julius Nyerere, even offered in 1960 to delay the imminent independence of Tanganyika (due in 1961) in order for all of the East African territories to achieve independence together as a federation. In June 1963, Kenyatta met with the Tanganyikan President Julius Nyerere and Ugandan President Milton Obote in Nairobi. The trio discussed the possibility of merging their three nations (plus Zanzibar) into a single East African Federation, declaring that this would be accomplished by the end of the year. and subsequently, discussions on the planning for such a union were initiated. Privately, Kenyatta was more reluctant regarding the arrangement and as 1964 came around the federation had not come to pass. In May 1964, Kenyatta rejected a back-benchers resolution calling for speedier federation. He publicly stated that talk of a federation had always been a ruse to hasten the pace of Kenyan independence from Britain, but Nyerere denied that this was true. Around the same time, Obote came out against an East African Federation in favour of pan-African unity, partly because of domestic political pressures with the semi-autonomous kingdom of Buganda being opposed to being in an East African federation as part of Uganda but rather as a unit in its own right. By late 1964 the prospects for a wider East African federation had died, although Tanganyika and Zanzibar did form a union in April 1964, eventually becoming Tanzania. ^ a b c "The World Factbook". cia.gov. Retrieved 24 July 2016. ^ a b "Report for Selected Countries and Subjects". imf.org. Retrieved 24 July 2016. ^ a b "Uganda Sunday Vision (2004-11-28): One president for EA by 2010". Sundayvision.co.ug. 28 November 2004. Archived from the original on 31 October 2012. Retrieved 15 July 2012. ^ "East African trade bloc approves monetary union deal". 30 November 2013. Retrieved 19 January 2018 – via Reuters. ^ The African Executive. "James Shikwati (2006-06-14) The Benefits of the East Africa Federation to the Youth. The African Executive". Africanexecutive.com. Archived from the original on 15 May 2012. Retrieved 15 July 2012. ^ "FACTBOX: East African common market begins". Reuters. 1 July 2010. Retrieved 6 April 2019. ^ "South Sudan admitted into EAC". Daily Nation. 2 March 2016. Retrieved 4 March 2016. ^ "South Sudan Oil Transit to Resume, Lamu Project will continue". GroundReport. 16 March 2012. Retrieved 15 July 2012. ^ "EAC prepares to admit South Sudan". theeastafrican.co.ke. Retrieved 24 July 2016. ^ Sudan Tribune. "ST (2013-10-15) Uganda hosts meeting of experts to fast-track political federation of East Africa". SudanTribune.com. Retrieved 20 October 2013. ^ "East Africa: Further Delays for the EAC Political Federation". 20 December 2014. Retrieved 4 May 2015. ^ "Ahead of election, Museveni says he wants to build East African superstate #UgandaDecides". Newsweek. Retrieved 22 October 2016. ^ Ubwani, Zephania (30 November 2016). "East Africa: Finally, East African Nations Agree to Disagree On Federation". The Citizen (Dar es Salaam). Retrieved 24 August 2017. Arnold, Guy (1974). Kenyatta and the Politics of Kenya. London: Dent. ISBN 0-460-07878-X.